Ashes on the Waves was absolutely stunning. It was a taut narrative, with passionate characters and a gloomy mood completely different from anything in the YA market at the moment. This novel – loosely based on Edgar Allan Poe’s Annabel Lee – had allusions to Poe throughout the text that enhanced the story without being obvious. The beautiful setting, harsh undertones of discrimination and hidden secrets, and enthralling romance made this a page-turner. The mood was absolutely glorious. It was somber and stormy, but not depressing. Little details and lovely writing contributed to the incredible world-building. It was a heavy atmosphere, gloomy in the vein of Poe that really took influence from the voice of Poe. It astounds me how Mary Lindsey was able to create such a tribute to Edgar Allan Poe, without being obvious and creating a beautiful piece of art that could easily be enjoyable for somebody who never knew that it was connected to Poe. For those readers who understood that it was a retelling, there are hints and allusions buried within the narrative. At the beginning of some chapters were excerpts from Poe’s poems that fit the events in the chapter perfectly. Instead of feeling like Lindsey inserted them to make her story line up with Poe’s work, it was woven in so naturally. Instead, the allusions enhanced the story and simply made it more of an experience. I LOVE relationships where they both make each other better. Sure, there can be angst and drama and passion, but overall, the best relationships in books and in life is where they make each other better in the end. Liam helped Anna and softened her brash personality, and Anna helped Liam confront his past and his own demons. 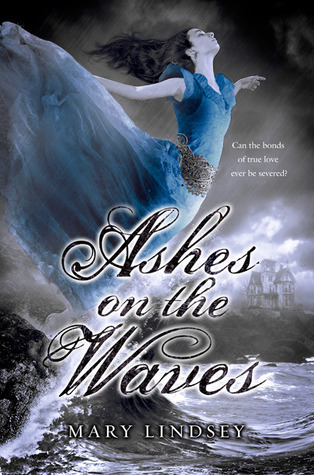 Ashes on the Waves was very different from a lot of YA retellings out there, because it was not an obvious caricature. Even if you’ve studied any Edgar Allan Poe, you’re kept guessing until the very end. You don’t know what happens and it doesn’t seem like it would be based off the poem. It connects to the poem, sure, but it’s a completely different story. One that’s complex and dark and satisfying. Liam was a great guy. He was tender and thoughtful, with a surprising strength when confronted with discrimination and his past. His bluntness and emotions made him a standout in the spectrum of YA love interests. Anna changed him, not in a completely obvious way, but subtly throughout the book. It worked well with the plot and he showed his devotion to her throughout the obstacles. He wholeheartedly loved her, and had a truly unique personality. He wasn’t picture-perfect and but he was truly a wonderful guy. He believed in things and learned throughout the book and was one of the most realistic male characters that I’ve read about in YA. I loved how the book relied on selkies. There were supernatural elements in there that weren’t obviously related to Poe. Lindsey draws on many different inspirations and they mesh together wonderfully. I’m a fan of selkies and mermaids and sea-related stories (I’m a Floridian) so I automatically devour any book that mention them. It almost reminded me of Revel by Maurissa Guibord – isolated village that associates with deadly creatures – and it was such a huge part of the book. Dòchas had such a distinct culture that smoothly integrated this type of lore into its daily life. Liam’s formal speech took me a chapter or two to really get into but then I found myself in love with it. It was very stiff at first, because that was the Dòchas culture. It ended up working very well with the tone of the book though and I found myself enjoying it. It made everything that much more distinct. His voice actually ended up reminding me of Edgar Allan Poe but with a charming twist. I would have liked more explanation of them as children. There’s all this mention of Liam and Anna being childhood friends and Liam painting Anna as a child, but it fast forwards only to them as teens, with off-hand mentions of their past. I would have liked to know how they got to know each other, because otherwise it felt like a plot device to excuse the instant love. I wouldn’t quite call it insta-love because they didn’t quite fall in love immediately. They had a backstory – granted, one that wasn’t really explained that well – but there were backstories and experiences that contributed to it. love was a little quick but I completely believed in it. I wish there was a little more development instead of instantly falling for each other – doubts instead of complete surrender to their love – but it was very well written. The writing was really what kept me in love with the story; it contained elements of all the most glorious things to pay tribute to Poe. It was infused with this Gothic feel that kept the story edgy. I can’t remember the last book that got me this emotional over an ending. I was sobbing my eyes out and about to throw the book at a wall because it was just so heart-wrenching and so perfectly written. It was literally the best way it could have ended, but it still stomped my heart into a billion tiny pieces. That was a very very risky ending and it took extreme talent to pull that off. Props to Mary Lindsey. Liam was a hardworking, misunderstood guy who was slightly awkward and ridiculously refreshing. I feel like if not for the Dòchas culture, he would have been a Southern gentleman. This was a boy who knew how to treat people even when they were awful to him. He withstood a lot of suffering over the course of his lifetime, and it was all undeserved. Between his disability and his loyalty to Anna, he suffered a lot that made him stronger in the end. Specifically, Anna made him stronger. Anna was this enigmatic girl who wasn’t afraid to be brutally honest. Unlike most of these stereotypical “strong, rebellious” female characters, she was also surprisingly vulnerable, which added depth to her character that surprised me. She was sweet and strong, but not in an overbearing way. There were some definite threads that hinted at untold stories and dynamics. I would have loved to know more about Francine and the history of the selkies – it was such a well-built dynamic that I would have loved to see more of it explored. Francine was sassy and like a mother to Liam. She was one of my favorite characters because of her refusal to let the village overwhelm others and her otherworldly charm. There were so many threads: some I would have liked to see explored more, but most of them knotted up at the end and took me completely by surprise. There were so many little things that I ADORED about this book that added up. With a dark mood, tender relationship, and stunning storylines, Ashes on the Waves is an electrifying read. Recommended to anybody who loves: Lost Voices; Nevermore; Lament; Fallen; Revel; Edgar Allan Poe; ocean-based reads. I can’t wait to read this. It sounds amazing and I love the cover. Great review!